Day 16: Expecto patronum! What form does you patronus take and why? I took the Patronus quiz on Zimbio and they said my patronus is a wolf! I’m not sure I would have chosen that on my own–the quiz assumes I’m far more of an assertive leader than I really am. However, those ARE qualities I am trying to develop in myself (much like I think I earn my spot in Gryffindor by wanting to be brave more than I actually am). So I’ll take the wolf! The more I think about this, the better it is. Imagine a swarm of dementors attacking, shouting “Expecto Patronum!” and a silvery wolf appears, leaping at them and snarling to keep them away. I can’t imagine a better patronus. If I hadn’t taken the quiz, I might have said a cat. Not so much to fight dementors, but just like, for a peaceful companion. But I already have a cat companion, so I guess a wolf patronus would balance things out. One for fighting, one for resting. Day 17: Favourite Harry Potter fan adaptation? Runner up (a very close second!) goes to The Shoebox Project for giving the world a novel-length look at the Marauders time at Hogwarts. Day 18: Least favourite book? 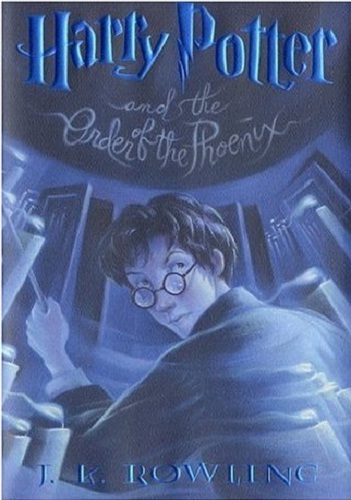 Even though the “worst” Harry Potter book is still one of my favorite books of all time, I would definitely put The Order of the Phoenix at the bottom of my list. The beginning is slow, and whiny Harry really got on my nerves the first time I read it. Later I could appreciate Rowling’s insistence on portraying her protagonist as an actual teenage boy, but….it still doesn’t make for fun reading. I really liked the Department of Mysteries ending, and while I HATE that Sirius died, I also love that characters are not above danger. Look, I somehow got into listing things that I like about HP5, so clearly “least favorite” has very little weight. Day 19: Do you prefer the books or films? I once heard this comparison described as follows: The HP movies are like eating an M&M. It’s delicious and enjoyable. But the HP books are like eating a 64 oz. chocolate bar. You can gorge on the feast, and suddenly that little M&M doesn’t seem quite as appealing. They’re both delicious, but I choose the books 100% of the time. Day 20: If you got to meet one member of the cast, who would it be? Daniel Radcliffe. He seems grounded, despite his world-famous status at a very young age. And he seems really weird, so he would be so much fun to hang out with! But then there’s Emma Watson! I think we would have a lot in common; we could discuss HeforShe and I would ask her what it’s like to work with Ewan McGregor (in the new Beauty and the Beast movie). Ooo and Emma Thompson! And Dame Maggie Smith! I mean, really, this cast is golden from oldest to youngest. I would just probably not want to hang out with Michael Gambon, since I heard he didn’t even read the books after being cast as Albus Dumbledore. Day 1: Your favorite book? Day 2: Your favorite movie? Day 3: Is there anything in the film adaptations that annoyed you? Day 4: Least favorite female character and why? Day 5: Favorite male character and why? Day 6: Which house would you want to be in? Day 7: Favorite female character and why? Day 8: What’s your favorite lesson from the series? Day 9: Who’s your least favorite male character and why? Day 11: Which character would you say you are most like? Day 13: Your least favorite movie? Day 14: Team Voldemort or Team Harry? Day 15: Pick three characters to be your best friends at Hogwarts?